2009 – Satoshi Nakamoto introduced the virtual currency Bitcoin. Using Cryptocurrencies along with public-key encryption, the currency is recorded on the transaction log. 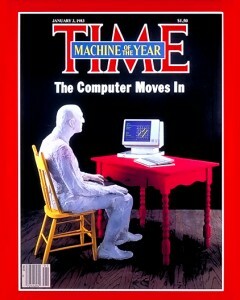 1983 – Instead of naming a person of the year for 1982, Time magazine decides to give the dubious honor to the Personal computer. It was interesting that it happened so early in the computers’ existence. Nonetheless, the computer was praised for it’s symbol to 1982. Now think of how that has changed in the last 28 years. TIME‘s Man of the Year started in 1927, to put Charles Lindbergh on the cover. Lindbergh refused an article based on his trans-Atlantic flight and Time wanted to find a way to put him on the cover.